Josh Collmenter is playing for his fourth different team in 2010, at four different levels. The tall right-hander played for the Visalia Rawhide of the Class-A Advanced California League, the Double-A Mobile Bay Bears and the Triple-A Reno Aces. Now, the starter with the funky delivery is doing his thing for the Scottsdale Scorpions in the Arizona Fall League, and he’s doing it well. Through three starts for the Scorpions, Collmenter has a stellar 1.80 ERA over 10 innings, with six strikeouts. Among starters with at least 10 innings so far, only two pitchers have an ERA better than Collmenter’s. 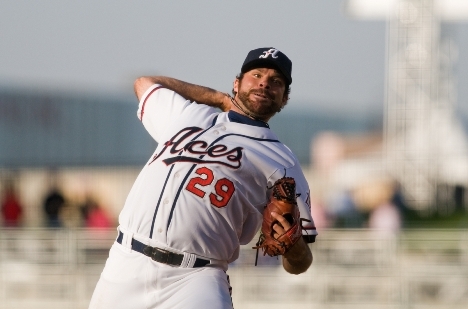 With his minor league track record in 2010 — a 3.38 ERA with 133 punchouts in 152 innings, 137 of which were at Mobile and Reno — coupled with likely significant changes at the Major League level, an appearance on the big league team in 2011 is a realistic goal for Collmenter at some point, if not at the outset of the season. It’s an impressive opportunity for a guy who was drafted in the 15th round only three years ago. His weapon is his changeup, and it drew rave reviews from former Mobile teammates Barry Enright and Konrad Schmidt. Collmenter has had success locating the pitch where he needs it, and his unique delivery (which involves holding his right hand behind his head for longer than a pitcher would generally keep it there) makes it difficult for a batter to pick it up. “The biggest key last year was being able to throw it for strikes and really use it,” Collmenter said. “The changeup is the pitch that really got me where I am in my development, level to level. I’ve been able to hone that and make it do different things if I want to get a strikeout or if I want to get a groundball. The biggest key for me is being able to throw the changeup any time. Even more than the chance to pitch, the Fall League offers players the chance to get to know teammates inside the organization that they may not have played with before, or opposing players who they’ve played against but haven’t gotten to know previously. — Outfielder Marc Krauss started for the Scorpions in left field on Thursday, going 1-for-4 with a double. Last Friday, Krauss had highlight-reel night, driving in seven runs with a double and a grand slam in a 12-4 win for Scottsdale over the Peoria Javelinas. More than anything, it will be fascinating to watch Krauss’ development over the next few weeks in the AFL, as many of the pitchers in the league come from more advanced levels than him. — Outfielder A.J. Pollock has been terrific for the Scorpions so far. His .387 average is second among Scottsdale players, and he’s hit four doubles with seven RBI in eight games. Pollock didn’t play all year after suffering an elbow injury in Spring Training, so it’s great to see him off to such a hot start here. — Pitcher Bryan Shaw hasn’t allowed a run yet in AFL play, throwing six shutout innings with four hits and two walks allowed. Shaw spent the season starting at Double-A (4.26 ERA in 33 starts), so his development will be interesting to keep an eye on.